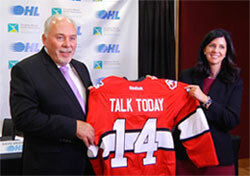 Talk Today, the new mental health and suicide awareness program launched by Canadian Mental Health Association (CMHA), Ontario and the Ontario Hockey League (OHL) has generated significant social media buzz and received national and province-wide media exposure, helping both organizations spread the news about the importance of mental health and elimination of stigma and discrimination. Designed by CMHA Ontario specifically for the OHL, Talk Today aims to raise awareness about suicide and promote the mental health of young athletes. 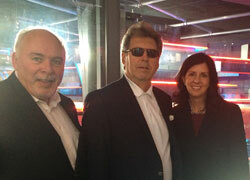 The program features four key elements: CMHA Mental Health Coaches that will be associated with each of the 20 OHL teams; mental health and suicide awareness training for players, coaching staff and others involved with players both on and off the ice; Talk Today outreach events hosted by OHL clubs; the designation of OHL champions to act as a further resource for their teams as well as participate in outreach activities. Before the announcement, CMHA Ontario and the OHL promoted the use of #TalkToday to generate Twitter discussion while CMHA Ontario also live tweeted from the news conference. Less than 48 hours later, the hashtag had reached nearly 640,000 unique followers on Twitter with nearly 1.4 million overall impressions. Overall, the response from followers on Twitter was overwhelmingly positive. As for media coverage, the following national news organizations covered the announcement.